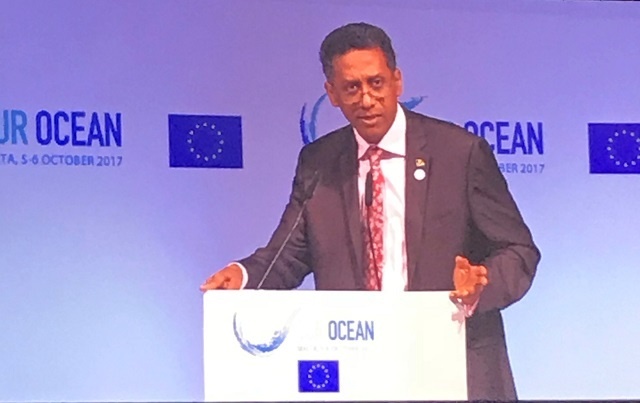 (Seychelles News Agency) - The importance of maritime security cooperation for Seychelles was highlighted by the island nation’s president at the Ocean Conference in Malta on Thursday. Faure was speaking to world leaders, entrepreneurs, civil society leaders, scientists and researchers at a high-level panel discussion on maritime security on the opening day of the Ocean Conference. “Maritime security is an extremely important component of the sustainable development of the ocean economy. One of the expected results of the blue economy strategy is greater protection for Seychelles’ ocean space,” said Faure. The Seychelles archipelago in the western Indian Ocean has an Exclusive Economic Zone of 1.37 million square kilometres around its 115 islands, a fact that makes detection of irregular and unlawful activities at sea difficult. The Ocean Conference which started in 2014 was organised under the theme ‘An Ocean for Life’ and hosted by the European Union from October 5–6. Prince Charles, the Prince of Wales, was the keynote speaker at the fourth edition of the conference. According to the news agency maltatoday, the Prince of Wales said that the problems facing the protection of the oceans were not only enormous but “also systemic and interrelated” and their remedy can only be found by building a consensus across a wide range of stakeholders and communities. Malta today said by way of example, Prince Charles referred to a decision taken by Canada 25 years ago to protect the Northern cod stocks on the Grand Banks by closing a fishery that had all but collapsed due to mismanagement and overfishing. Other panel sessions of the conference focused on marine pollution, marine protection and climate-related impacts on the ocean. The Ocean Conference welcomed participants from around the globe to reaffirm many of the voluntary commitments made at recent United Nation’s conference in support to the implementation of Sustainable Development Goal 14 held in June this year.